Raleigh, N.C. – North Carolina lawmakers received another update on the impacts of Hurricane Florence on Tuesday from Secretary Mandy Cohen of the state Department of Health and Human Services (DHHS) and officials from the Emergency Management Division (EMD) and Department of Transportation (NCDOT). 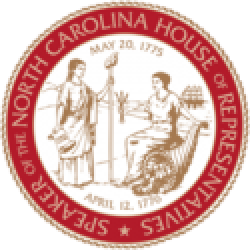 State House Speaker Tim Moore (R-Cleveland) also joined representatives of eastern North Carolina and other officials to conduct damage assessments Monday and Tuesday. 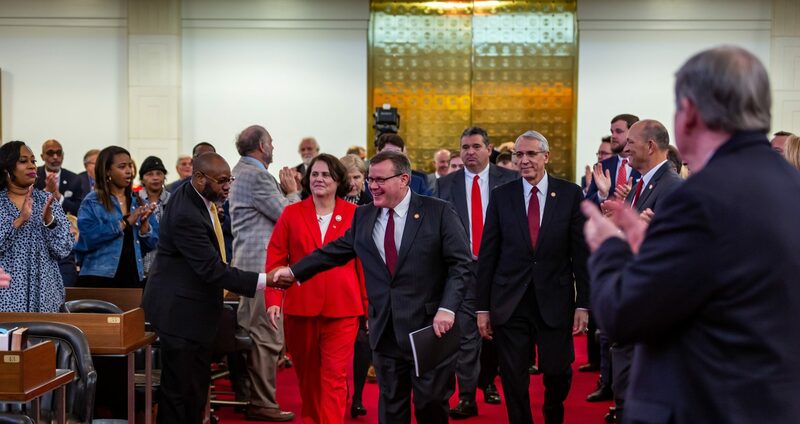 Lawmakers heard that there has been little to no precipitation across North Carolina today, but there are several rivers that are cresting today and maybe later in the week. Many other people are still dealing with the effects of flooding or first feeling its impact, so officials are not changing the tempo of response but are moving into recovery components. The governor is on his way to Wilmington today with FEMA administrator Brock Long, a North Carolina native now embedded in the state EOC. They will be touring the Wilmington site today and some of the destruction there and starting to think about what the state can do to rebuild that area and others affected by the storm. North Carolina now has 18 counties with major federal disaster declarations, there are several more that are pending or that will be submitted for review by FEMA over the next coming days. If lawmakers have constituents interested in those declarations and their county is not on the list they should reach out to the state EOC through the established channels. Anyone in a disaster county, or not, can go through FEMA application process if they believe they need to get access to those funds or other services, by dialing 1-800-621-FEMA or visiting FEMA’s website. Duke Energy sent a press release today indicating the latest date they have set for restoration of power in the most difficult to reach areas is Sept. 26, 2018. They are moving into recovery phase in other areas but they are still responding with life-saving missions in others. The team at the state Emergency Operations Center (EOC) is still fully activated with all staff and partner agencies, local, state and federal officials. Approximately 2,200 swift water rescues have been completed and another 578 animal rescues, and the mission focus remains on search and rescue and other life-saving missions. They are currently asking state and federal teams in partner agencies and other states to continue evaluating the future need of other swift water rescue teams so they can decide how many to remain and continue operating in the coming days. They continue to have commodity resource requests from counties but with intermittent access via ground in impacted areas they are getting creative with partner agencies and are engaged with heavy aircraft operations and seeking potential access via water as well. There are currently approximately 73 states of emergency still active, 77 shelters are open with about 10,000 people they are housing. Those numbers have gone down significantly but that is still a lot of people and they definitely need assistance and the state must continue to support them. Two state-supported shelters are now open in Winston-Salem and Chapel Hill, they’re working to consolidate evacuation shelters and facilities to improve efficiency of services. Four state medical support shelters remain open, they have a lot of resources for medical transportation in the field for impacted regions and are working with partners states to move public health staff into shelters and areas they need to be. The current power outage estimate is about 330,000 people, that peaked at about 880,000 during the storm so private sector utilities have done an incredible job of moving in quickly, but that is a lot of people in the state without power. They may be without power for just a little bit longer. On fuel supply, there have been a lot of questions, the supply remains stable and officials are trying to bridge logistical gaps of distribution now that there is more access via ground or air. More of that commodity is moving but there is more to do there as well. State officials reinforced the event at Brunswick’s nuclear plant was due to access issues and not related to any threat to health or safety of the public, and it has been cleared today. Several 911 service centers have experienced some degradation of access but support measures are in place and most are open. There remain intermittent voice and data outages as well, that reported number may go up as people get back into their homes. They are working with state and federal agencies and private sector partners to move resources into those areas. 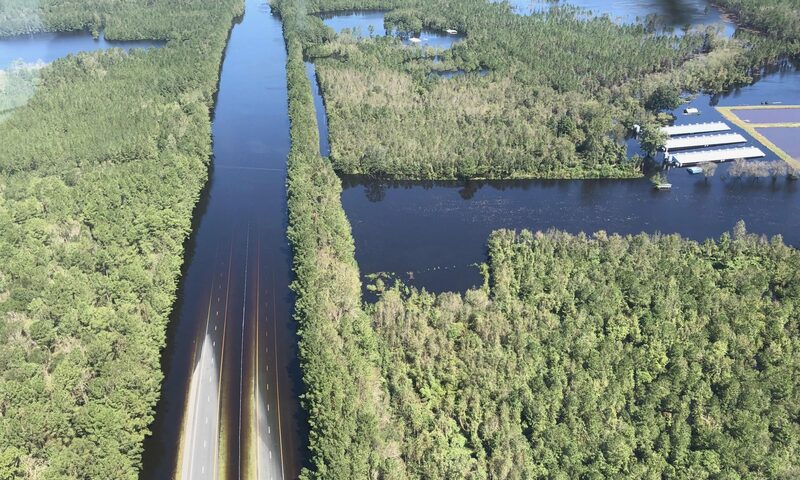 Unless there is a public safety reason to return to eastern North Carolina, officials encourage folks to stay off main roadways that currently have limited capacity so public safety personnel and resources can get to the areas they need. EMD officials continue to survey an analysis of high-risk critical infrastructure, particularly dams, hog lagoons and coal ash ponds. There are a number of U.S. Army Corps of Engineers-owned reservoirs and dams, and there are no scheduled releases of those reservoirs upcoming. There’s always a lot of questions and fear from some folks that the Corps is going to start releasing water to relieve pressure and flood communities, and that is not the plan. There are an estimated 34 privately owned hog lagoons impacted at various levels, they are working with state partners in infrastructure and DHHS to ensure appropriate monitoring and assessments and testing of those. The Department of Environmental Quality’s (DEQ) dashboard on their main website has the latest figures they have on animal operations, structural damages, discharges, and other statistics. Six privately owned dams have been impacted, one is actively being barricaded right now, protective measures were taken early in the week by FEMA and the National Guard. Specific to EMD, the volume of resource requests that have come into the state EOC has really gotten large and the database is pretty large after nine days, so they will try very hard at the liaison level to get lawmakers responses on their status requests, but to that end they request that if a county has a resource request to check on, lawmakers should use the reference number accompanying that request with state EOC. It is officials’ understanding President Donald Trump will visit the state as well as South Carolina tomorrow, we don’t yet have details on his travel plans but those will be communicated as they become available. Officials from the state Department of Transportation said they continue to have over 1,100 road closures mostly in Division 2 and 3 in the eastern part of the state. I-95 and I-40 are also impacted and closed, and they anticipate that will be the case for at least a couple more days at the earliest. They have mobilized over 2600 employees, 248 contractor crews, they continue to relocate DOT personnel from divisions less impacted to those that took the brunt of the storm. They continue to urge residents to please not travel especially in impacted areas, issues are arising of travelers impeding progress of first responders. Secretary Mandy Cohen from DHHS said they continue to be very busy at the department, the one new message from the department is the effort to recruit additional nurse volunteers. It isn’t an urgent need, they have what they need now, but they will need to switch nurses out to give them rest and support. In anticipation of that need they are asking for volunteers, they should go to the DHHS website about registering with the Red Cross for individuals or through the DHHS as a team. Lawmakers are asked to please help push out those messages. DHHS continues to seek flexibility in larger programs they operate out of DHHS, like the food and nutrition services program, folks can now purchase hot food for immediate consumption using EBT and electronic benefit transfer cards. That applies to all 100 counties because people are displaced all over, and it is active until end of October. Similarly, in the WIC assistance for women and children program,, in affected counties they proactively loaded an extra months of benefits on their card so beneficiaries don’t have to come in for extra benefits, they have access to funds without visiting an office. Further flexibility in Medicaid program is being exercised to help folks get the care they need so doctors and providers coming into state have flexibility to help folks. Four medical shelters remain open in Charlotte, High Point, Goldsboro and Clayton, in addition to regular shelters. Medical shelters are tailored for folks with specific medical needs whether oxygen, dialysis, etc. They continue to have beds available, individuals do need to be referred through a local emergency management agency. DHHS continues to offer a disaster hotline for counseling 1-800-985-5990 so help is out there for those with mental health troubles. They continue to push out the public health message of “Turn around don’t drown.” There have been 26 deaths as of 8 a.m. this morning, most were completely preventable and the result of driving through water. Water levels are rising and they rise quickly. On the hospital front, DHHS has deployed a mobile hospital to the Kinston area, it has seen about 70 patients. It operates like an emergency room, then if people need higher care they are triaged to other places. They continue to work with hospital in impacted regions to monitor staffing and supplies, they’re doing a great job staying in communication.